When it comes to sod farms, Montana is one of the leading states in production. If you are looking for a quick and easy way to beautify your lawn, installing sod is the perfect way to do this. Why is sod often found in Montana? One of the main reasons is because they have wide open spaces with gently rolling hills. This state has ideal growing conditions because the weather is neither too hot, nor too cold. Sod that is grown in Montana can be installed almost any time during the year, even on frozen ground. Many sod farms that operate in the state of Montana have been in operation for decades. Selstad Sod Farms - this farm has been in operation since 1954 in Great Falls, Montana. They sell sod by the pallet in slabs or by the roll for homeowners or landscapers. The slabs weigh 15 pounds and can be lifted and installed easily. The rolls are 32 inches wide by 100 feet long and can be easily installed with a special forklift attachment. Bitterroot Turf Farm - in operation since 1994, this sod farm is located in Bitterroot Valley, Montana. The Bitterroot Turf Farm grows Kentucky bluegrass sod and a mixed sod of Kentucky bluegrass and fine fescue. 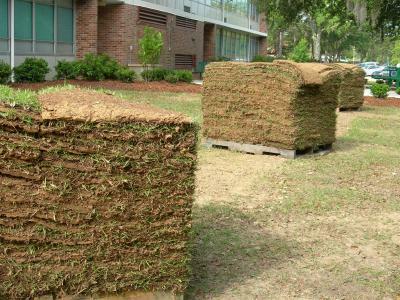 They sell sod to both commercial landscapers and residential owners. From football fields and golf courses to suburban homes, this sod farm has delivered their product to customers in Montana, Idaho and Wyoming. Summit Valley Turf - with two locations in Whitehall and Harrison, Montana, this sod farm has been in operation since 1997. The owner, Ben Wagner, sells the sod in 10 square foot rolls to both commercial landscapers and residential property owners. In addition to selling Kentucky bluegrass sod they also offer a wildflower sod for homeowners seeking to beautify their landscape with native wildflowers. Be sure to check out listings for many more sod farms in Montana that do not have an Internet website. Homeowners can opt for sod slabs or sod rolls. If you are going to use the sod in a small area or will need to cut the sod to accommodate a lot of trees or shrubs, slabs are the easiest way to complete the installation. Slabs are easy for a homeowner to install, as many weigh less than 20 pounds per slab. However, this type of installation will take much longer and the slabs need to be installed quickly to minimize slab shrinkage and create smooth seams.Rolls are perfect for people who have a large area to cover and few obstructions in the area to be covered. They are also good for hillsides and areas where establishing seed has been difficult. It is best to have sod rolls installed by landscape professionals or people who have previous experience with this method of installation. They will use a forklift with a special attachment to quickly and evenly roll out the sod. Add some curb appeal to your home and landscaped areas with sod. If the cost of sod isn't an issue, you'll have a beautiful home within a week or less. Whether you live in Montana or another area, there are local sod farms growing beautiful grass that is native to your area.